Dr. Nick J. Bruno became the eighth president of the University of Louisiana at Monroe on Nov. 8, 2010, and now has more than 40 years of work in Louisiana higher education. Upon his arrival at ULM, President Bruno immediately began reaching out to the community by creating the Business & Community Advisory Committee, a group that analyzes the workforce needs of the region. In 2012, President Bruno was appointed to the West Monroe-West Ouachita Chamber of Commerce Board of Directors, the Monroe Chamber of Commerce Board of Directors, and the St. Francis Medical Center Board of Directors where he continues to serve. He is also a member of the Ouachita Business Alliance, the Workforce Development Board Area 81, and the Committee of 100 for Economic Development, Inc.
A Louisiana native, President Bruno arrived at ULM from the University of Louisiana System, where he managed the business, financial and facility operations as the UL System's vice president for business affairs. Prior to his appointment at the UL System, he served as vice president for business affairs at ULM, helping revitalize the campus during a critical juncture in the university's history beginning what now totals over $100 million in campus improvements. ULM's sister school, Southeastern Louisiana University, also benefited from President Bruno's leadership. While there, he served in several capacities, including assistant vice president for special initiatives, handling such areas as continuing education and international activities. In addition to his higher education experience, President Bruno is regionally and nationally recognized for his consulting expertise in areas such as organizational efficiencies and alternatively financed facility construction. He has also conducted numerous professional development programs for several national professional organizations including the National Association of College and University Business Officers (NACUBO). In September 2011, the National Association of College Auxiliary Services awarded President Bruno the Presidential Award of Excellence. 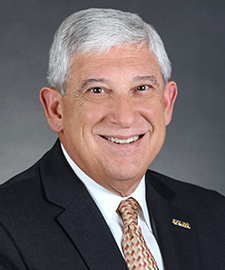 President Bruno earned a bachelor's degree in accounting and an MBA from Southeastern Louisiana University. He earned a Ph.D. in Higher Education Leadership from the University of Mississippi. He served as an adjunct member of Southeastern Louisiana University's College of Business faculty where he taught Strategic Management. President Bruno has contributed numerous articles to various higher education publications and presented programs on campus services management, quality management, outsourcing of campus services, and strategic management. He is married to First Lady Linda Bruno, and they have three children.